These 6 3/4 inch long tuna jigs weigh about 5 ounces. Add your own hook and split ring to customize this jig to your needs. 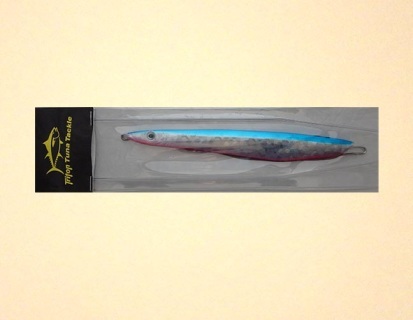 Holographic blue jig with black spots. Jig only, no hook or split ring. Holographic blue and pink jig. Jig only, no hook or split ring. 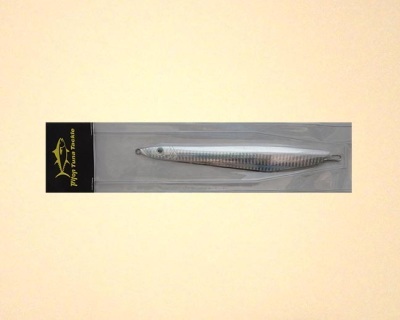 Holographic chrome colored jig. Jig only, no hook or split ring. Holographic green and yellow jig. Jig only, no hook or split ring. Holographic pink jig with black spots. Jig only, no hook or split ring. Customers outside the USA may be asked to send additional money to cover the cost of shipping before their products ship.